Step 1: in the first place, we recommend you to create a backup of your conversations on the instant messaging app. This process will allow you restore them if you later on decide to download and install the official WhatsApp Messenger or any other MOD, as is the case of WhatsApp Plus. 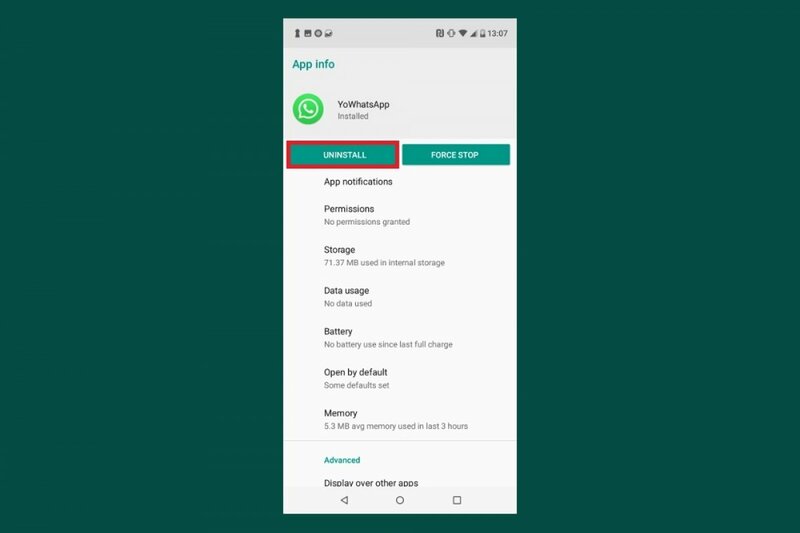 You can find this option in the app’s settings, being able to store the backup in your phone’s memory or on the cloud storage service, Google Drive. Step 2: once you’ve backed up your chats, go to the Settings menu on your Android and from there, access the applications manager of this mobile operating system. Step 3: in this menu you’ll find all the applications installed on your smartphone. Scroll down to find YOWhatsApp. Once you’ve got it, press its icon to open the options menu. Once open, tap the button to uninstall the application and simply wait a few seconds for the process to be completed. YOWhatsApp is one of the best WhatsApp MODs that we can download and offers us loads of extra functions for this instant messaging and chat app. Amongst the latter, we have to point out its features that grant us greater control over our privacy, more options when it comes to sending files or the possibility to customize the interface, as it allows us to get hold of new themes that come along with different colors and fonts.